298 pages | 5 B/W Illus. This book adopts an innovative conceptualization and analytical framework to the study of anti-system parties, and represents the first monograph ever published on the topic. It features empirical research using original data and combining large-N QCA analyses with a wide range of in-depth case studies from 18 Western European countries. The book adopts a party-centric approach to the study of anti-system formations by focusing on the major turning points faced by such actors after their initial success: long-term electoral sustainability, the different modalities of integration at the systemic level and the electoral impact of transition to government. The author examines in particular the interplay between crucial elements of the internal supply-side of anti-system parties such as their organizational and ideological features, and the political opportunity structure. Anti-System Parties is a major contribution to the literature on populism, anti-establishment parties and comparative political parties. "With in-depth case studies of parties in 18 Western European countries, this book offers unique insights in the life-cycle of anti-system parties. In addition, the theoretical chapters provide a detailed conceptual discussion and analytical tools to understand the barriers and opportunities faced by anti-system parties. A most useful resource for party scholars." Emilie van Haute - Chair of the Department of Political Science at the Université libre de Bruxelles, Belgium. "Using a sound conceptual base and a robust mixed-methods approach, which combines both in-depth case-studies and fsQCA, this book constitutes a perfect complement to Sartori’s classical work. In a time where democracy seems to be under threat more than ever before, and certainly since the inter-war period, this book helps us to resolve the mystery of both why and how anti-systemic parties have managed to stir the traditionally stable Western European cocktail. A must-read for party politics and democratization scholars alike." Fernando Casal Bertoa - Associate Professor in Comparative Politics, University of Nottingham, UK. "With its focus on anti-system parties, this books looks at a very important political phenomenon of our times which characterizes today’s democracies. Zulianello’s analysis is theoretically well-rooted in the comparative politics literature. Applying a large-N QCA, the results are achieved through an innovative methodological approach." Claudius Wagemann - Professor of Political Science Methods, Goethe University Frankfurt, Germany. "Zulianello’s book is a welcome improvement of the current state of conceptual analysis about anti-system parties and a rigorous application of the concept to current Western European political landscape, where anti-system parties have recently gained power in the electorate and institutions. I have little doubt It will become a necessary reading and valuable guideline for future research on the transformations of European party systems." - Filippo Tronconi – Associate Professor of Political Science, University of Bologna, Italy. 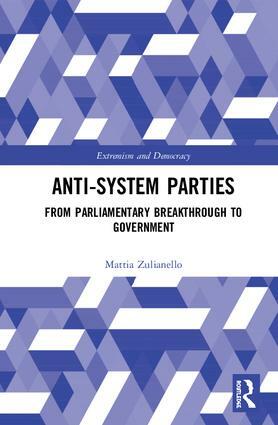 "Zulianello’s book offers a new typology of political parties, including a much needed reconceptualitation of "anti-system" parties able to account for their different modalities of integration and radicalisation. Uniquely, it explains variation in how anti-system parties achieve electoral sustainability following a parliamentary breakthrough. Theoretically astute and methodologically sound, it is a great addition to the available literature on party competition and the evolution of party systems and will become an inescapable point of reference for research and teaching in these areas in the years to come." - Daniele Albertazzi - Senior Lecturer in European Politics, Department of Political Science and International Studies (POLSIS), Univeristy of Birmingham, UK. 3. Enduring or fleeting challenges to established parties? 5. Governing between metapolitical and coalitional pressures: electoral asset or liability? 6. Epilogue: A new wave of anti-system parties in crisis-ridden Europe. Mattia Zulianellois a postdoctoral researcher at the Department of Political and Social Science, University of Florence, Italy.